GET READY TO “TURN ON, TUNE IN, TOKE UP,” SIXTIES-STYLE. After the success of Marijuana Madness: Prohibition, the acclaimed 2018 burlesque musical set from the 1930s to the 1950s, Grassfed and the Miss Marquez are proud to announce in 2019 the second part of the Marijuana Madness series--Marijuana Madness: Revolution, an entirely new hip happening about the (r)evolution of cannabis during the psychedelic era. After the noir 1940s and the family values 1950s, America started waking up to the joys of pot through the far-out Beatniks and the late 1950s counterculture. And Beat culture begat The Beatles and Bob Dylan—who famously encouraged everyone to get stoned. And everyone did, including students, demonstrators, activists, Mad Men, soldiers in Vietnam and even the occasional cannabis-curious suburban housewife. 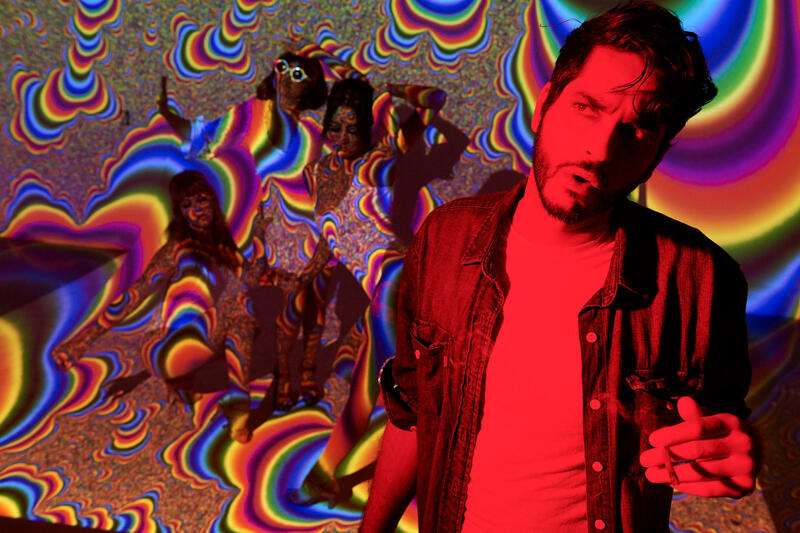 This burlesque musical brings together some of the most accomplished dancers in Los Angeles to perform live interpretations of the psychedelic era of the 60’s to a weed-tastic soundtrack. All the while, the true story of the (r)evolution of cannabis during the period is retold in an inimitable, crowd-pleasing style by host and ace marijuana journalist Abdullah Saeed (Vice’s “Bong Appetit,” HBO’s “High Maintenance,” and “Great Moments in Weed History” podcast). We encourage guests to dress in the colorful threads of the Peace and Love era to enjoy this immersive, mind-altering event. Featuring burlesque artists Miss Marquez, Nikki Dalonzo, and Jamie Donovan, who bring the 60’s to life, accompanied by “The Willie McNeil Experience”, and vocalist Jessie Payo. Burlesque Artists Miss Marquez, Nikki Dalonzo and Jamie Donovan bring the 60s to life accompanied by "the Willie McNeil Experience" and Vocalist Jessie Payo. The show itself is book ended--before, during intermission, and after--by the chance to visit the nearby Groovy Lounge. Guests entering this trip-enhancing lounge space can elevate their experience with the signature smoke-free Grassfed vape bars, and get an intimate introduction to the cast before/during intermission/and after the show. Sponsors include vape pens by Eel River, extracts by Papa's Select, and more. The festival of light, visuals (burlesque performances by The Miss Marquez, Nikki Dalonzo and Jamie Donovan) and sound (the Willie McNeil Experience) that is the show itself is book ended--before, during intermission, and after--by the chance to visit the nearby Weed Wonderland. Guests entering this trip-enhancing lounge space can elevate their experience with the signature Grassfed vape bar, and delectable health conscious edibles, while getting an intimate introduction to the cast of the show. An immersive, mind-altering environment Marijuana Madness: Revolution, encourages patrons to get into the mindset of the Peace and Love era, including the rare opportunity to dress up in the colorful threads of this most groovy of sartorial periods. Grassfed events are for members only. First time guests are required to complete the Grassfed membership application questions when purchasing a ticket. Unapproved applications will be refunded full ticket price. * Applications are reviewed within 24 hours or less. There is ABSOLUTELY no sale of any products at our events, nor tickets sold at the door. Do I need a doctor's recommendation letter to enter the event? No. All adults 21+ who are Grassfed members are welcome. Can I purchase any products at your event? No. If you like any of the products from our sponsors, you can inquire with them on how / where you can purchase their product. Yes, the venue is accessible by wheelchair. 60's psychedelic attire “highly” recommended. You are welcome to bring your favorite strain to use in our vape bars (no smoking allowed). How can I become a Grassfed member? There are two ways to become a Grassfed member, you can fill the membership application on grassfed.la, or complete the membership application questions when you purchase a ticket. ** A full refund will be issued in case your application is denied. What is the exact address for your event? Exact address will be provided in the ticket purchase confirmation (DTLA - Arts District). Only to another Grassfed member.